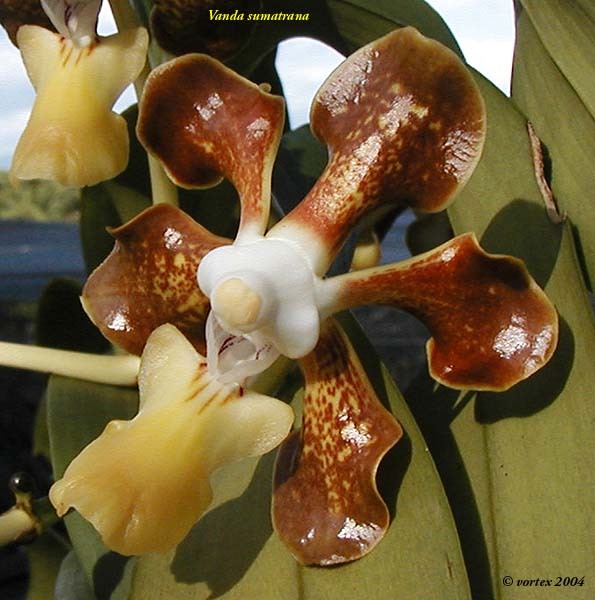 Vanda sumatrana Schltr. 1911 Photo courtesy of Nik Fahmi and his Vortex Orchid Page. Found in Sumatra at elevations of 300 to 1000 meters as a large to giant sized, hot to warm growing monopodial epiphyte or lithophyte on rock faces with an elongate, erect to pendant stem carrying many, strap-shaped, curved, obliquely bilobed apically and irregularly toothed leaves that blooms in the spring on an axillary, 5.4" [13.5 cm] long, few  flowered inflorescence carrying flowers that smell of creosote.